I love trying different types of cookies and gifting them to people. I think, these are the best gifting option as it can be stored for a long time, not too sweet hence a win-win situation if the person you gift is not a fan of sweets. Its also a great way to incorporate chocolate and satisfy your chocolate craving anytime you want without feeling too guilty. I got one such opportunity when my sister in law was going to Bangalore to meet her elder sister. The elder sis-in-law wanted some Delights and I decided to make something which looks beautiful like her. To make that happen, I decided to use her favourite (and mine too!) Nutella. The richness of Nutella swirled into dough of wholewheat flour and butter makes the cookies ''Divine". 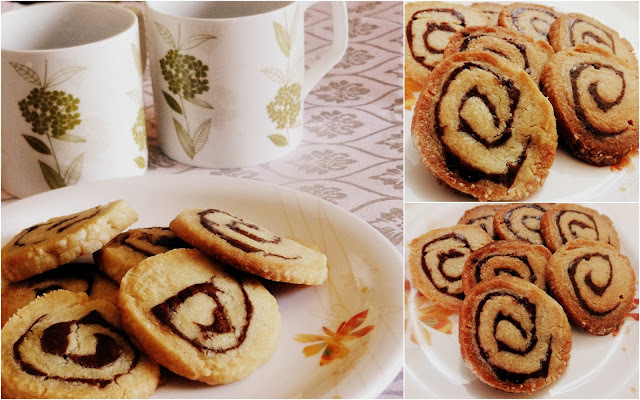 Hence, presenting you Eggless Nutella Pinwheel Cookies. Before that, I have to share the story of making these cookies. I made the rolled up the nutella spread cookies dough and kept it in the freezer overnight to harden so that they are ready to bake in the next morning when my sister-in-law had to catch the flight. But, the next morning I got so late in normal house chores that I got to baking these cookies only when there was just one hour left for her to check-in for the flight. She had left for office in the morning, hence I needed to bake it, pack it and leave for the airport which was about 15 kms from my home. I was under so much pressure that I was feeling like I was participating in some Masterchef competition. I utilised every single second in that hour and was just on time, like a minute before she had to check-in for the flight. Phew! As they say, All's well that ends well. My cookies reached safely to Bangalore and made an awesome tea time delight for my sweet sis-in-law. I adapted the recipe from The Purple Foodie, a great website by a young girl Shaheen Peerbhai from aamchi Mumbai and is currently based at Paris. I looked up to her recipes and aspire to win scholarship from Le Cordon Bleu like her some day. The recipe posted by her uses an egg, I omitted the egg and used a little milk to combine the dough as some in my family don't prefer eggs. It worked great! Preheat your oven to 180°C/ 350°F. Line two baking trays with parchment paper or grease it with some butter. In the bowl of your stand mixer or in a large bowl using you hand mixer, cream butter and sugar until light and fluffy. Add in vanilla extract and give it a good mix. Scrap down the sides as needed. Sift in the flour and mix it until the dough is all combined together. Make a ball of the dough using your hands, wrap it with some cling film/ plastic wrap and keep it in the refrigerator for about half an hour to firm it up a little. This will facilitate rolling out the dough nicely. Sprinkle some flour on your work surface and roll out the dough into a rectangle of ¼ inch thickness. Rotate the dough with your hands while rolling. Spread a good amount of Nutella on the top surface and make sure to leave one finger space on all four sides. Sprinkle over the chopped hazelnuts and roll up the dough. Freeze the roll for about 2 hours or upto over night before cutting the slices. I used dough cutter to cut the slices. This can be done with the help of a sharp knife as well. Place the slices on a pre-lined baking sheet and bake for 12-14 minutes until the cookies are slightly brown at the edges. Rotate the sheet around half way through the baking. Shaheen suggests baking time will vary depending on how thick or thin you have cut them. Hence, look for the colour as a good indication. Now you are ready to enjoy these wonderful cookies. Hope you would also enjoy making this cake as much as I did! Don't forget to share your experiences by way of comment on the blog or on FB! I would love to hear from you guys!